CHECK OUT OUR NEW CAMU CAMU PRODUCT- IT’S GOT >50% MORE VITAMIN C ! It’s official!! Study in Japan confirms Camu Camu’s superior anti-oxidative & anti-Inflammatory properties over synthetic Vitamin C!! Check it out on our Research page. Camu Camu (Myrciaria dubia) is the name of a bush which grows in the Amazonian rain forest of Peru. Its fruit bears the same name and contains the most concentrated source of naturally occurring Vitamin C on the planet! The berries are about the size of a large grape and have a green or purplish red skin depending on its ripeness. The pulp is a crystal clear white and usually surrounds two seeds. The Camu Camu berries are wild crafted. Sara’s Choice Camu Camu grows in the Peruvian Amazon and is collected by local people by hand, via boat. “Sara’s Choice Camu Camu contains a Super High fruit content of 30:1 .” – That means it takes 3 kg of fruit to make 100g of product! 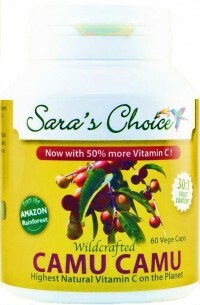 Sara’s Choice NEW Camu Camu uses the green (not yet fully mature) berries. These provide a higher vitamin C content. It is important to start the process immediately the berries arrive to achieve a high quality product. This starts with the removal of the seeds while protecting against oxidation, light and high temperatures. During the entire process the temperature is kept below 45 degrees celsius resulting in a minimum guaranteed Vitamin C content of 12% with an average of 14%. Most people in the modern world are suffering from micro-nutrient deficiencies simply because commercial food crops are grown in nutrient exhausted soil. This is why the rainforest is so important. The trees that produce Sara’s Choice Camu Camu grow in an Amazon flood plain. What this means is that each year during the rainy season the river banks flood and the trees are submerged under water for up to four months. As the water recedes the soil and nutrient matter that has been moved around the rainforest is re-deposited. This natural cycle ensures the richest nutrient soil for the Camu Camu. From this soil, the Camu Camu trees are able to pull a natural density of vitamins, minerals and amino acids in the exact ratios necessary for life. This is why our Camu Camu fruit is packed with a rich, balanced profile of unique, vital nutrients not available in synthetic vitamin C. Our Camu Camu trees are grown without using chemical fertilizers or pesticides. They are never fumigated or irradiated. We do not add any preservatives, fillers, flowing agents, sugar, salt, yeast, dairy products, gluten, synthetic ascorbic acid, colourings or any other additives. Vitamin C cannot be manufactured by the body and must be ingested. In 1937, Dr. Szent-Gyorgi won the Nobel Prize in medicine for identifying vitamin C and recognizing its important role in human health. Although he successfully isolated the molecule ascorbic acid, he insisted that his studies demonstrated the proven health benefits we all associate with vitamin C are actually created by the intricate interaction of numerous supportive co-factors found only in natural foods, not in isolated, synthesized molecules. It’s not just Vitamin C ! Camu Camu provides 499,000 ppm (parts per million) vitamin C, oranges provide just 500-4,000 ppm! In further comparison, it provides 10 times more iron, 3 times more niacin, twice as much riboflavin, and 50% more phosphorus. It is a significant source of potassium, providing 900mg per 100g of fruit. Camu-Camu also contains bioflavonoids, beta-carotene, calcium, limonene, alpha-pinene, protein, thiamin, resveratrol, valine, leucine and serine. This rich profile of nutrients including B complex vitamins, minerals and amino acids also support proper serotonin levels and can aid in the absorption of vitamin C. Clinical evidence suggests that Camu Camu is far more effective than synthetic ascorbic acid. As we age, inevitably we lose some of the elasticity or “tightness” produced by the collagen in the skin on our faces. What are the main builders & preservers of collagen making our skin look younger than our years? Vitamin C and bioflavanoids! What food/botanical has the most powerful natural vitamin C-bioflavanoid complex in the world? Camu Camu!